World 4-2 is the second course of World 4 in Super Mario 3D Land. The level takes place underground and features several Goomba Towers and Inky Piranha Plants. The level also contains a hidden Warp Zone that takes Mario to World 5. Mario will start in an area with low and high platforms, that come in yellow and blue colored variations. There are a Goomba Tower and Inky Piranha Plants. To the far left side, Mario will find a hole where he can enter. There are two ? Blocks (one contains a single coin and the other, a Fire Flower) and a ! Block to create yellow blocks to reach in two bouncy platforms, that lead to an small area with another ! Block to get to a smaller place, where Mario find another Inky Piranha Plant and a ! Block. The yellow blocks reach in a bigger room, with a ! 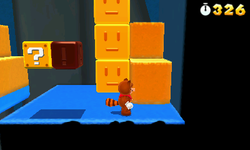 Block, another Goomba Tower, a rectangular ? Block with two Coins and a Fire Flower. Mario can use another trampoline to go to a hole in the ceiling, where are another Goomba Tower, another Inky Piranha Plant and another ! Block. In a vertical room in the left, the plumber uses Trampolines to collect coins and reach on a Warp Pipe that conducts he to the final part. In the final area of the level which is outdoors , Mario can use a last ! Block to create yellow blocks that go toward the Flagpole. Star Medal 1: Above the first Inky Piranha Plant, a Star Medal is hidden by the ceiling above the it. Mario can collect it by jumping. Star Medal 2: Next the third Goomba Tower, there is a small gap in the wall. Mario must crouch walk into it, dropping down to an area side which contains a Star Medal. Star Medal 3: Mario must create yellow blocks with the second-to-last ! Block. Then, he can wall jump between them and the wall to reach on the Star Medal. Near the end of the level, Mario must bounce higher on the third bouncy platform, then wall jump to reach a higher area which leads to an orange pipe. Entering it will warp Mario to World 5. As with World 1-2, this warp is a reference to World 4-2 of Super Mario Bros. This page was last edited on April 5, 2019, at 18:11.